The Butte Creek Restoration Council (BCRC) engages the Prescott College community, our surrounding neighbors, and the larger Prescott community in projects that help to restore, enhance, and celebrate Lower Butte Creek as the centerpiece of our expanding campus and a vital part of the Upper Granite Creek Watershed. We invite you to explore the Butte Creek and the Restoration Project by beginning with the What and the Where. Then dig deeper to capture the depth and breadth of the project throughout the rest of this informative and interactive website. Join us on a learning journey! 7. Decreasing or eliminating the amount of non-native invasive and nuisance species. Watershed restoration work is challenging, but the investments today will be beneficial for us as well as for future generations. Watersheds involve a multi-disciplinary approach that reflects the certainty that environmental restoration is not enough. All people live, work, and depend on their watersheds, some do this without knowing so. The Butte Creek Restoration Council seeks to protect natural resources while cultivating a vibrant, resilient economy within the Granite Creek Watershed and on the campus at Prescott College. Where is the Butte Creek? 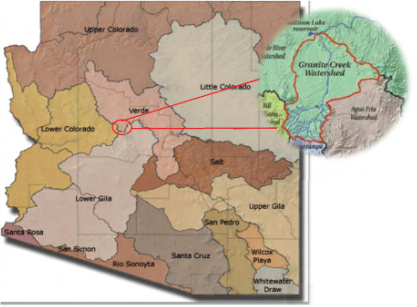 The Butte Creek is located in central Arizona in the Upper Granite Creek Watershed. 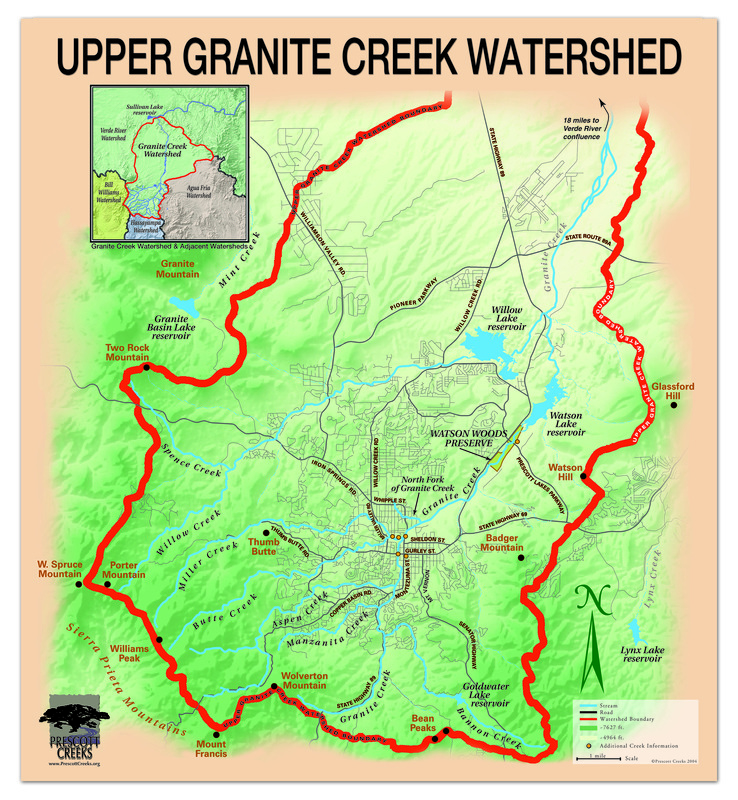 The creek is situated around the city area of Prescott, Yavapai County and the Upper Granite Creek Watershed is a part of the greater Verde River Watershed. Butte Creek's headwaters can be found just southwest of Thumb Butte, near where the Sierra Prieta and Bradshaw Mountains intersect. The creek begins in the Prescott National Forest then flows through the city of Prescott, roughly seven miles downstream to its confluence with Miller Creek (Miller Creek then flows to its confluence with Granite Creek). The Butte Creek Restoration Council at Prescott College works mainly with the lowermost quarter mile of Butte Creek that flows through the college campus between North Willow Street and Grove Avenue.